The inaugural management fest of IIM Udaipur, Solaris, was a two day extravaganza held on the 7th and 8th of November. The fest was entirely conceptualized and executed by the student body and earmarked the exponential growth the college has seen since its inception. The fest encompassed a wide array of activities from summits, workshops to umpteen competitions. The summits and workshops covered all domains of management and were graced by industry veterans and provided huge impetus for learning. The competitions too provided an interesting mix ranging from testing participants on core domains such as finance, marketing to a short film making competition and the high competence level helped bring out the best in the students. The first day started with an address from the director of IIM Udaipur, Prof. Janat Shah. He outlined the key focus areas of the institute’s growth and how the concept of Solaris was directly in sync with the college’s focus on holistic growth. He emphasized on research, transformation and contributing to society as the key pillars of growth of the institute. Prof. Shah’s address was followed by an enriching talk from industry behemoth and keynote speaker, Mr. Subir Gokarn( recently appointed executive director of the IMF). He helped provide a comprehensive view of India’s growth potential and the means to eradicate the present frailities to exploit this potential. The keynote address was followed by the first summit, The Leadership Summit. This is the flagship event of the Media and Industry Interaction Cell of the institute and as in the preceding three editions, this time too, the summit had industry veterans such as Mr. Unnikrishnan(CEO, Thermax), Mr. Sandeep Budhiraja( Country Head, MMR Research Worldwide),Mr. Ajay Gupta( COO, Decimal Point Analytics) and Mr. Manish Rastogi( Head, Metro Cash and Carry) attending. Their speeches helped provide detailed perspectives on specific industries and the macroeconomic situation. They helped provide unique interplays on the central theme “Evolve” by helping elucidate as to how companies consistently break through existing norms and bring about innovation in all spheres to cope with the present times. Samvaah , the marketing conclave organized by the marketing club Marclan, was the other summit held on the first day. The theme for the event was “The Future of Marketing” and had a keen focus on the advent of new marketing techniques in view of the tried and tested concepts becoming obsolete in the present scenario. The conclave had industry marketing wizards such as Mr. Ramamoorthi (Managing partner at Ogilvy and Mather), Mr. Abhishek Joshi (Director- Digital Marketing and Customer Acquisition at Redbus), Mr. Atindriya Bose (Country Head of Sony entertainment) and Ms. Gayatri Ojha (Brand Communications & Insights Head – M-Pesa at Vodafone India).They emphasized on the dynamic nature of the marketing field and the practices needed to remain abreast with this dynamism. The speeches covered a wide array of topics such as digital marketing, new age advertising and also marketing techniques to popularize novel initiatives such as M-Pesa. The second day commenced with Arth-Samvaad, the Finance Summit which was organized by Finomina, the finance committee of the college. The presence of industry stalwarts such as The Chief Economist at YES BANK– Dr. Shubhada Rao, Associate Director at NVS Brokerage- Mr. Kamlesh Mehta and Executive Director of IDBI Bank Ltd.– Mr. N.S. Venkatesh helped provide the ideal platform for future financial managers to interact with them and help understand the intricacies of the financial world. The panel discussion was on the topic “Currency Chaos: Where will it lead to?” where the industry experts helped decipher the intricacies and position of the Indian Rupee along with the market swings brought in by the Chinese Renminbi. The panel discussion was followed by Mr. Deepak Mohanty(Executive Director of the RBI) addressing the audience on the objectives of the central bank and how the RBI has coped with global financial pressures in the past. Mr. Mohanty helped enrich the audience regarding the key financial indicators and how performance on these indicators is a sign of growth. The summit concluded with the dignitaries unveiling the finance magazine-Arthaarth and hence concluding another successful edition of the summit. The final summit of the fest was Technovate, the IT-Entreprenuership Summit which focused on the booming world of startups and how technology was the key enabler for this boom. The industry leaders in attendance were Mr. Manoj Sharma the Chief Technical Officer of Quikr, Mr. Vishal Verma the Operations and Logistics Manager of Uber, Mr. Anil Joshi of Unicorn India Ventures, Ms. Aditee Rele, the Lead in Technical Evangelism at Microsoft, Mr. Piyush Poddar, the Director of Professional Services at Axelerant and Ms. Lalitha Yanamandra, the General Manager of Enterprise Services & Delivery at MartJack and they spoke on the topic “Evolution of entrepreneurs in IT”. The summit was an extremely engaging medium as the panel discussions helped shed light on various facets associated with startups i.e. investment , target market, evolving technology etc. Mr. Anil Joshi, founder of early stage investment provider, Unicorn India Ventures, too provided inputs on the investment cycle. The summit helped educate budding entreprenuers of the essential parameters to start a successful enterprise and was a huge success. The various competitions and workshops were held across the two days and provided ample opportunities for learning and testing one’s competencies. The various competitions included events that tested core concepts such as Vitt-Sangram, the finance case study competition and marketing events such as Juxtapose, the ad-making event to events such as the short film making competition which was judged by eminent director Mr. Vibhu Puri. The competition was extremely intense as a number of teams were from other top B-schools such as IIM Ahmedabad, Symbiosis, IIM Amritsar etc. The students of IIMU too gave their best and bagged laurels in several events. A number of workshops were held too such as the Dabbawala workshop, the Consultimg workshop etc which were attended in great numbers as students had the chance for close interaction with industry veterans. The Dabbawala workshop in particular was a huge hit as Mr. Vijay Aggarwal provided an in depth study of the world famous supply chain system of the Dabbawalas. The two day inaugural fest was thus organized on a very grand scale even though the college is in its nascent stage. The various summits and workshops proved to be ideal grounds for learning and understanding of the various facets of the corporate world. The competitions tested competencies to the hilt and hence proved to be ideal for the best minds of the country. The smooth conduction of the event in itself provided umpteen challenges but the coordinated efforts of the student body and everyone associated with the institute helped the IIM Udaipur fraternity pull it off. Hence, Solaris was a huge success and it certainly set the benchmark for other top B-schools to emulate. Indian Institute of Management Udaipur successfully concluded its final placement season for the class of 2015 of its flagship Post Graduate Programme (PGP). The institute achieved an incredible feat of 100% placement yet again as the big corporate houses in the industry continued to trust the quality of the management education delivered. This year, 48 companies made 104 offers across various domains. The institute showed its marketing prowess as Sales & Marketing domain continued to offer the highest number of offers. 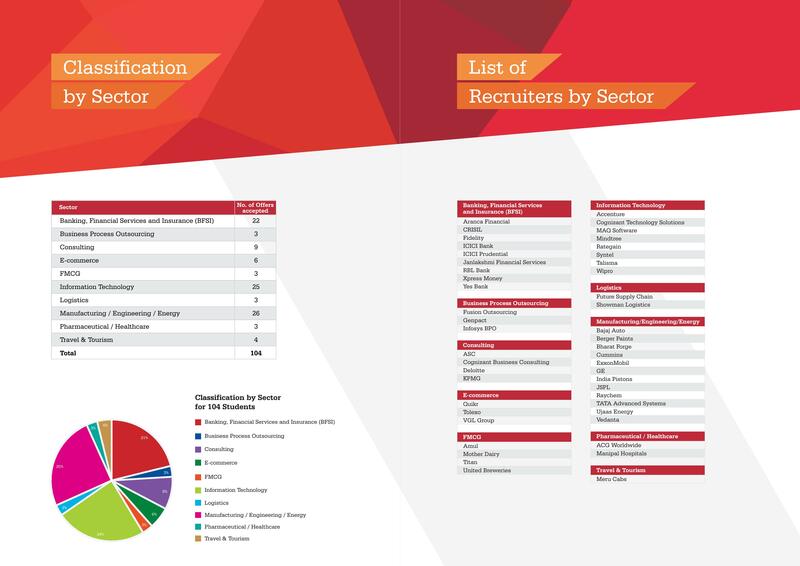 All the three major sectors Banking/Financial, Manufacturing/Engineering/Energy and IT/ITes competed strength to strength with almost equal number of recruitment offers. 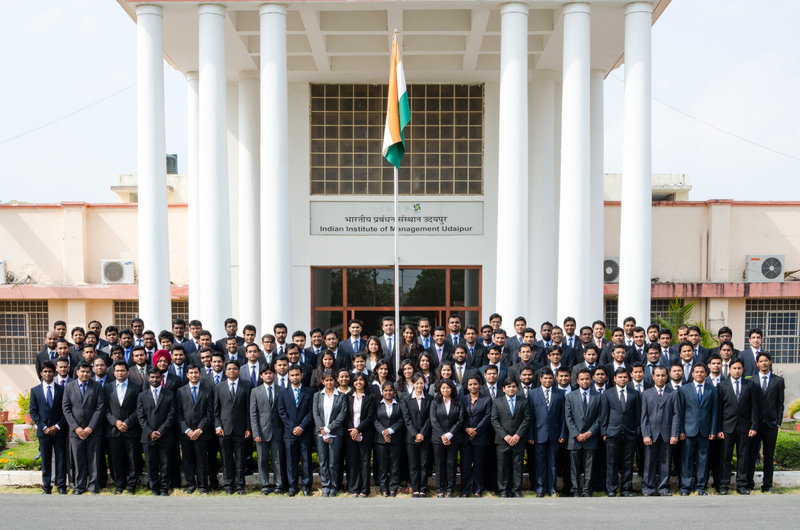 The outgoing PGP 2013-15 batch made numerous contributions to building a competitive culture in the institute with significant achievements in diverse fields such as extra-curricular activities, event management, entrepreneurship , business competitions, sports, cultural festival and social activities. 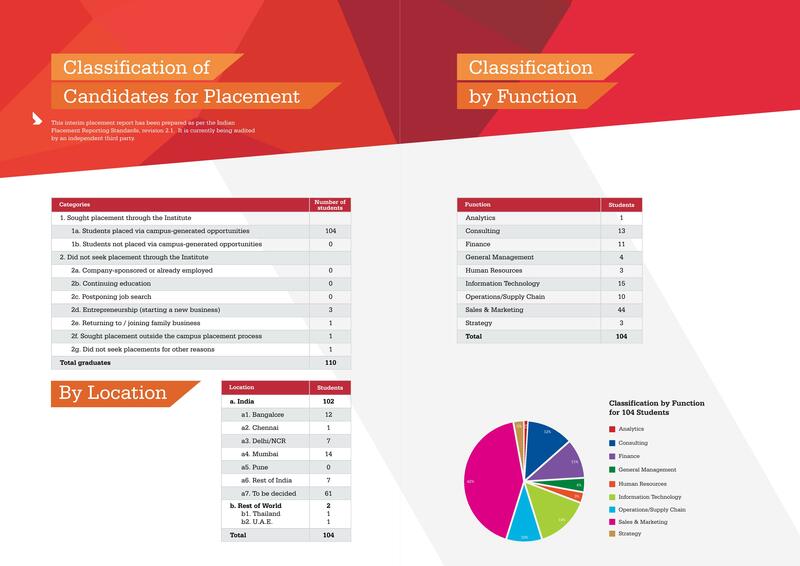 The robust placement season concluded with impressive statistics of average salary of Rs. 13.62 lakhs per annum for the top quartile. The average placement figures for the top 50 percentile stood at Rs. 12.20 lakhs per annum. The changing business scenario influenced companies to hire the quality talent for assigning key roles and responsibilities with average salary of Rs. 10.28 lakhs per annum. The institute continued to strengthen its association with past recruiters like Accenture, Aranca, Bajaj Auto, Cognizant Technology Solutions, GE, Genpact, ICICI Bank, Mindtree, Mother Dairy, Quikr, Showman Logistics, Titan, Vedanta, Wipro, Yes Bank to name a few. The institute also takes immense pride in associating with prominent first time recruiters like ACG Pharma, Amul, Berger Paints, Bharat Forge, Cognizant Business Consulting, CRISIL, Cummins, Deloitte US, ExxonMobil, Fidelity Investments, Jindal Steel & Power, KPMG, MAQ Software, Meru Cabs, RBL Bank, Raychem RPG and United Breweries. 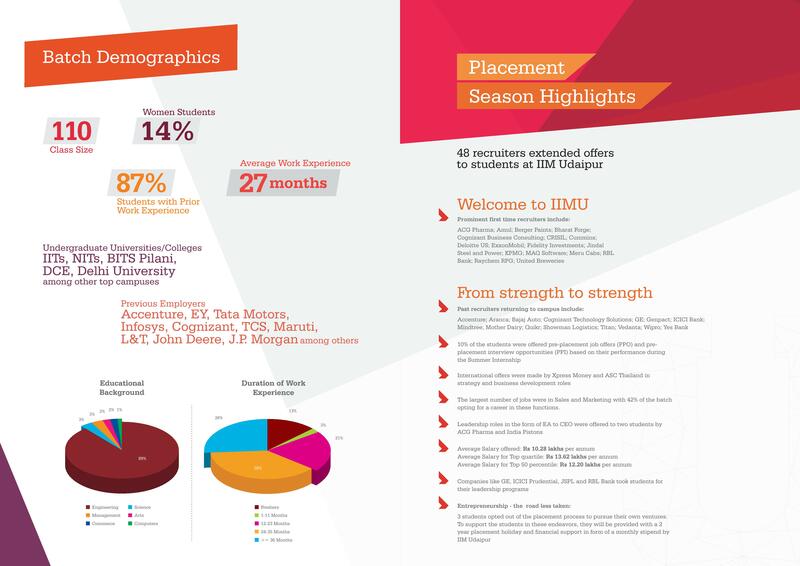 10% of the students were offered pre-placement job (PPO) and pre-placement interview (PPI) based on their performance during the summer internship. International offers were made by Xpress Money and ASC Thailand. Companies including ACG Pharma and India Pistons offered leadership roles such as Executive Assistant to CEO. Fostering the spirit of entrepreneurship, the institute takes pride to announce 2 year placement holiday to 3 students who took the road less travelled and opted out placement process to pursue their ventures. To support their endeavors, IIM Udaipur will also provide them the financial support in the form of monthly stipend of Rs. 20,000 per month. The institute is proud to be one of the few B-Schools that follow the Indian Placement Reporting Standards (IPRS) to bring transparency in reporting its placement statistics. It is always a sense of great joy and excitement when students of IIM Udaipur meet an eminent business personality. Preserving the legacy of industry interaction, the students of IIMU had the privilege of having Mr. Raghuttama Rao CEO & Managing Director at ICRA Management Consulting on campus. 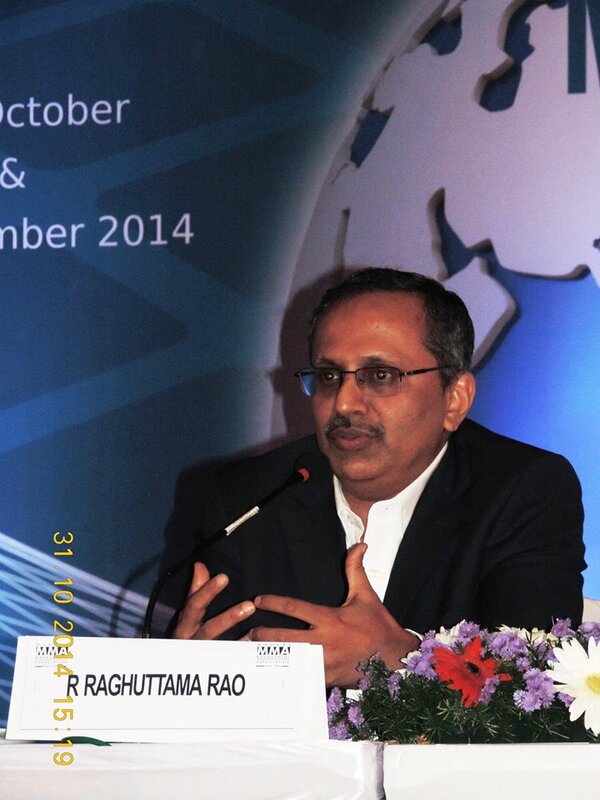 Mr. Rao started his excellent career with undergraduate from IIT Madras; post which he did his MBA from IIM Ahmedabad. He was a Fulbright Scholar at Carnegie Mellon University Pittsburgh, USA where he gained proficiency in Cost Accounting. Being a member of ICRA’s start-up team, Mr. Rao has contributed to developing many areas of ICRA’s business, including Credit Rating, Management Consulting, and Research. He has served on ICRA’s Rating Committee for about ten years and has experience across several sectors, including infrastructure, banking/finance, structured finance, manufacturing, and energy. Sharing his experience, Mr. Rao first emphasized the importance of economics and accounting in finance. He said that most students and even industry experts in finance domain lack the conceptual understanding of accounting and economics and hence are unable to deal with unprecedented scenarios. He recalled the amount of struggle he faced while learning cost accounting but said that the hard work paid off in the end. Mr. Rao explained that the students should come to know their strengths and weaknesses in deciding the career path. He stressed on focusing on those streams that fit with what the students are good at, and what they really enjoy doing. Hence, in terms of consulting, Mr. Rao asked the students to ponder upon two fundamental questions: “What is Consulting?” and “Am I fit for it?” before joining the field in the first place. He also explained that consulting is as much about people skills as it is about analytics. Exclaiming that at the heart of consulting is marketing; he said that communication skills, both verbal and written, are essential to the domain. He mentioned that though multi-domain knowledge is helpful in consulting, one should try to have an expert level knowledge about one or two fields and that one should be used to unprecedented situations as consulting usually presents with unstructured problems. Accentuating on maintaining health, Mr. Rao said that one should always maintain a balance between money and fitness. In addition, he said that one should use this time in MBA to read as much as possible about many streams and decide which way to go. He also said that one should dig deep inside and figure out the right reason for pursuing entrepreneurship and exclaimed that in entrepreneurship, one has many bosses. After the session, he was asked numerous questions by students ranging from how to prepare for the summer internship to the importance of certificates for various streams. The students of IIM Udaipur are glad and thankful they had the privilege of meeting Mr. Raghuttama Rao and get an insight into consulting, finance and entrepreneurship. Things which differentiate IIM Udaipur – Emotional Intelligence! Working in the complex business environments requires managers to take up decisions in which they are expected to consider not only the business implications but also the people affected by the decision and the process warrants the awareness of emotional intelligence. IIM Udaipur follows the pedagogy of grooming student managers with emotional intelligence along with excellent business acumen. The long term envisioning is to ingrain emotional intelligence in the activities in such a manner that the students uphold the values which represent the institute’s foundation. Over a longer period of time, students see themselves developing as leaders more confident of their capabilities and decision making judgment so that they land up better equipped with emotional intelligence in the corporate world. The academic courses like Organizational Behaviour and Business Ethics are specifically designed and modified, and their delivery methods customized to nurture emotional intelligence of students and the expectations from them in dealing with people as teams and resources in organizations. Furthermore, courses like Inspired Learning through Personal Mastery and Advanced Leadership Course taught by professors with decades of experience in Leadership Development strive to teach students learning by observation and self-reflection. Exemplary leaders from the senior management of various organizations are also invited to the campus whose leadership styles inspire students to critically analyze, comprehend and enhance the decision making skills of their own selves. IIMU is the only IIM in the country with a prominent collaboration with the global management consulting firm pioneer in leadership development, Hay Group. Hay Group’s programmes are inculcated in the curriculum through which all the students are mentored over a period of two years to work on the transformation of their initial emotional quotient with exercises like periodic self-surveys and peer reviews to imbibe a better and mature emotional intelligence in personal and professional self-development. Things which differentiate IIM Udaipur – Live Projects! IIM Udaipur follows the pedagogy of learning by doing. And the approach of inculcating of live industry projects into the curriculum provides a right mix of practical exposure to the students. Orchestrated by Consult-U – The Consulting Club of IIMU at the helm and coordinated by other clubs, Saksham – The Entrepreneurship Club of IIMU, Finomina – The Finance Club of IIMU and MarClan – The Marketing Club of IIMU, the projects are sought from industries. The projects are then awarded to the students and the entire process is managed by students to ensure that the opportunities are accessed by all. Project teams comprise of students from both the years and faculties are involved to mentor the projects execution. The projects help in establishing mutually beneficial relationships between the industries seeking young and innovative people with fresh perspective on management, and students who get to hone their classroom learnings and insights by blending them with real life business challenges. IIMU’s commitment to excellence and quality is assured in the projects deliveries through a carefully planned process comprising of initial briefing, mid-term review, periodic checks and final conclusion with the focus on advantages sought from the projects. 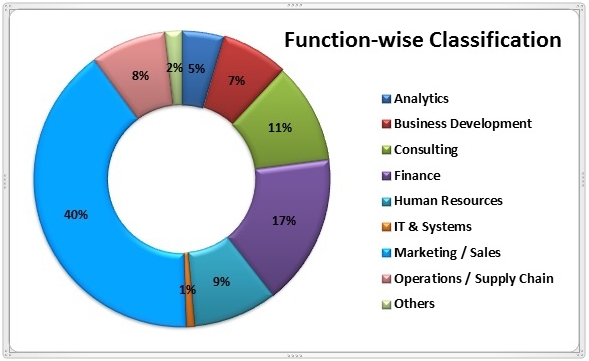 The diversity of the projects portfolio makes sure that students get hands-on experience on all the management verticals, company domains and business functions viz., finance, marketing, research, consulting, human resources, operations, IT, analytics and systems and even in drives like energy saving. Students of IIMU have been associated with and done projects with organizations primarily operational in healthcare, mining, food, hospitality, manufacturing, e-commerce among other sectors and with NGOs. The projects aid students to take up initiatives and learn the concepts by application helping in their sound development.